Meticulously crafted to ensure optimal performance, Neuro Tools deliver perfect results every time. This line features a state of the art design that includes ergonomic thumb rests, exterior LED displays, cushioned plates, and beveled edges to protect your hair from stress and demarcation lines. All Neuro irons have titanium surfaces that allow you to create waves, curls, flips, and perfect smoothing with ease. Unlike ceramic, titanium is scratch resistant and heats quickly to your desired temperature. A SmartSense microchip monitors temperature 50 times per second to ensure even heating. Discover a smarter dryer that is built for speed, endurance and performance. Tourmaline ions in Neuro Dryers dry your hair quickly and gently while reducing frizz. Paul Mitchell Pro Tools allow you to get a professional salon look -- at home. Each tool features an exclusive Express Ion Complex—the most advanced ionic technology available. Get sleek smoothness or bouncy curls! 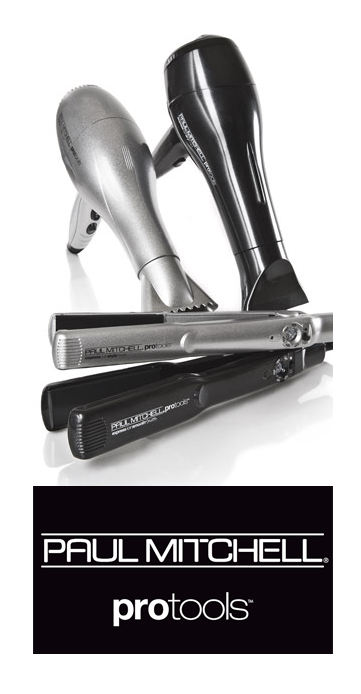 Paul Mitchell Irons allow you to style your hair faster with healthy, hydrated results. Dry your hair up to 60% faster and create healthy, shiny results. Pro Tool Dryers feature two temperature options and 2 speed settings along with a self-locking cool shot button.